The year is 1959 and the Cuban revolution, today most famously represented by Che Guevara and the brothers Raúl and Fidel Castro, has passed. Havana, the city that was previously known as the Paris of the Caribbean, is suffering greatly from the shortage of everything, but nevertheless the new government wants the city to reclaim its glory. This is where Comrades Player come in. Comrades Player are competing to build the most prestigious buildings in Havana with the materials available and when all else fails at the expenses of the other players. 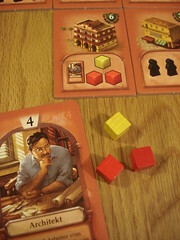 True to the theme, you start the game with almost nothing: only 1 peso and one random cube of building materials. To gather the required resources and actually build something you rely on a set of action cards, each player having an identical set. Before the game starts, you set up two rows of six building cards each and start a common pool of money with four pesos and a pool of building materials with three random cubes from the bag. At the beginning every comrade player chooses two cards to start the game with – face down at first, turned over when everyone has chosen. The action cards have two important pieces of information: the action you’re allowed to take (now everyone who didn’t see that coming raise your hands and keep them up until you finish reading) and a single digit at the top. The two digits everyone will have in front of them determine player order. You read them as a two-digit number, always with the lower digit first, and player order is from the lowest number to the highest. So, someone has “Black Market” (7) and “Protection” (2) in front of them, the resulting number is 27. To emphasise this once more: you read the two digits as one two-digit number. You do not add them up. I’m just saying this because most people instinctively try to do just that, and while making the sum would work it would radically alter the interaction and relative strength of the cards. When it’s your turn, you take the two actions your cards give you in any order. After taking your actions you may purchase any number of buildings, but only from the ends of the lines, so you always have four available. If you don’t have quite the right resources to pay for the building you want, that’s no reason to despair just yet: you can pay five pesos instead of one worker and five cubes of debris (grey) instead of one cube of any other colour. Whenever there is only two buildings left in a line, these two are moved outwards to the end of the line and the space between is filled up with four new ones. When everyone is done, three pesos and three cubes of building materials are added to the pool, then everyone gets to chose one new action card. In the same order as before, every player chooses one card from his hand and places it face down on one of his current ones; it will replace that card after everyone took their pick. This way, when it’s your turn to chose a new card, you don’t know yet what the players before you will do next, but you do know what they are not going to do. When everyone is done, the cards are turned over and the one replaced goes to the discard pile. You won’t get this card back until your hand is down to two cards, then you pick up the whole discard pile – this won’t happen in all games, some are over quick enough that you never get the chance. So when you chose the card to use, you better make it count. I’m tempted at this point to give you a list of all 13 cards to look at, because their actions are quite diverse, but that wouldn’t really make you or me happy. But generally speaking, there is only one card that lets you take all available resources of one kind: Debris, with a value of two, lets you take all grey material cubes. All other cards that allow you to take something either give you one or two resources, or half of the available ones. It’s the nature of “taking half” that you want to do it before anyone else can, because the part you actually take shrinks considerably. Unfortunately, the cards with the most interesting pay-out also have the highest numbers: Mama allows you to take half the building materials from the Pool but has a big fat nine printed on, Pesos does the same for money but at a value of eight. More direct interaction between players is rare, but it does exist with the two Thief cards that let you steal money or materials from a player going after you – or any player if you’re the last. Just as well, since their values of five and six things could turn out either way. Other notable cards include the Architect, who is required to buy some buildings, the Siesta, which does nothing but has a good chance of making you go first with a value of zero and Refreshment, which lets you take one card from your discard pile back to your hand. This last one is a rather unlucky translation, it has nothing to do with lemonade. Choosing which card to play is the one big decision you make every turn. There is a few more things to think about afterwards – what cubes to pick, which player to steal from – but they are generally easy to figure out. However, the decision which card to play is a juicy one: you obviously want to pick a card that brings you some kind of profit. But you also want to pick a card that lets you take your turn at the right time, and since that means early in most cases the potentially most profitable cards don’t help you here. 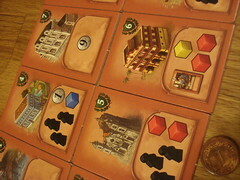 And you also want to make sure that you have a useful selection of cards left in your hand: ending up with Siesta, Protection, Tax Collector and Conservation means you will have two turns without gaining points, and since one game lasts around one cycle through the card deck this will happen right when the other players collect their final points to end the game. On our first few games of Havana, we all learned that one card to be especially weary off is the aforementioned Refreshment: getting a card you want back to reuse is very tempting, but once Refreshment is gone to the discard pile, you can not get it back until you pick up the whole pile. Taking card back with Refreshment means you take longer to get to that point, and having all your cards available on the last turns is a big advantage. Tempting as it may be, you’re better off using Refreshment late in the game, when you can see that getting one card back will make enough points for you to win – or maybe don’t using it at all and be the first player to take back your full deck. Making only one big decision per turn may sound limited at first, but it also means that the game keeps moving quickly. People may take a little to decide on their card, but unless you have some very thorough thinkers at the table this won’t give you enough time to take a smoke. Taking your turn is similarly quick, so everyone stays involved in the game and the 30 to 45 minutes do not have boring stretches. anticipate your opponents moves and a good memory. Even if you don’t count cards in other games, knowing what options your opponents still have available to them is invaluable and may well make the difference between victory and defeat. One gripe I have with Havana is the package size: Havana is, at it’s core, a card game with added resource cubes and meeples, and it could fit in a box about one quarter the size, thus saving valuable shelf space in the Meeplecave and maybe reducing the price a bit more. At least the big box is nice to look at, with an artistic style fitting the theme, and the same goes for the action cards – especially the Mama card. 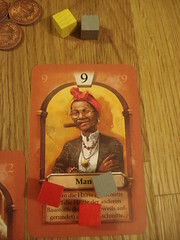 depicting an older woman with big glasses chomping on a zeppelin-sized cigar is one of my favourite game cards ever. The building cards, on the other hand, look a bit like they were copied from an old Sim City game. Havana offers a generally good time, not on the high end of strategic requirement but with some thinking required, and with small but enjoyable doses of schadenfreude every time you manage to pick up a big scoop of resources just before someone else can. Of all the animals out there, rats and their fleas are the only ones that managed to bring humanity to something that could have become an extinction event: the Black Death. Rattus lets you relive those fun days in the Middle Ages. Many here will recall playing one of the many incarnations of Mario Kart on their Nintendo console. Playing with a few people around the same TV was great fun, but had one big downside: it was not a board game. Now, finally, the same kind of fun can be had around the table, with up to 8 people in Junkyard Races. And oh boy is it fun.